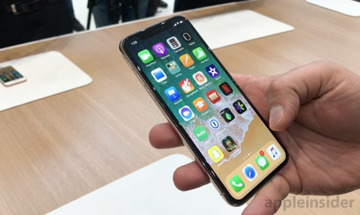 Apple released its first major iPhone redesign in three years on Tuesday with iPhone X, a technologically advanced smartphone that boasts an all-new OLED Super Retina Display, TrueDepth camera system, Face ID, A11 Bionic Chip with onboard neural engine and more. AppleInsider went hands-on with Apple's newest flagship and came away impressed by the handset's fit and finish. 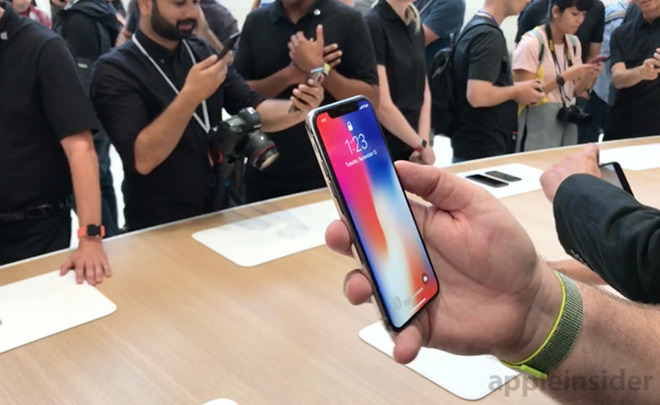 As analytically anticipated — based on what we already knew before the final details were unveiled and prior to some time hands on — iPhone X gives Apple the ability to drive sales of an "even more premium" smartphone, featuring specifications and capabilities that are harder (if not impossible) to launch in the mega-million volumes that existing generations of iPhones currently sell at. But with the details presented in the keynote—and getting to see and feel iPhone X hands on—this reality takes on a whole new meaning. Apple didn't just slap on a better camera and upgrade the screen resolution in order to charge more or declare a "technological first." The application of and integration between all of the new iPhone X features is nothing short of phenomenal. The application of and integration between all of the new iPhone X features is nothing short of phenomenal. The new Super Retina HD of iPhone X is shockingly great, with vibrant wide color and very dark blacks. 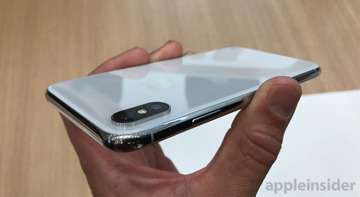 But it's also perfectly integrated into the new stainless steel case design in a way that's reminiscent of how Steve Jobs described iPhone 4 as having the high-end appearance and specialized look and feel of a Leica camera. iPhone 6/6s/7 shared a nice design, but it seemed basically utilitarian. So much so that every other phone maker copied it, calling it the obvious way one had to design a phone these days. iPhone X—and to some extent iPhone 8 as well—feels like a dive back into feeling differentiated and fancy. The iPhone X Super Retina HD display is also conspicuously integrated into the True Depth camera and sensor array. When watching a movie, you can view it unobstructed or expand it to full screen, which rounds off the corners and knocks out the slot where sensors sit. The former is nothing like the "flat tire" of the failed Moto 360 smartwatch, which half-heartedly tried to deliver a round display and just gave up on the bottom of the screen. 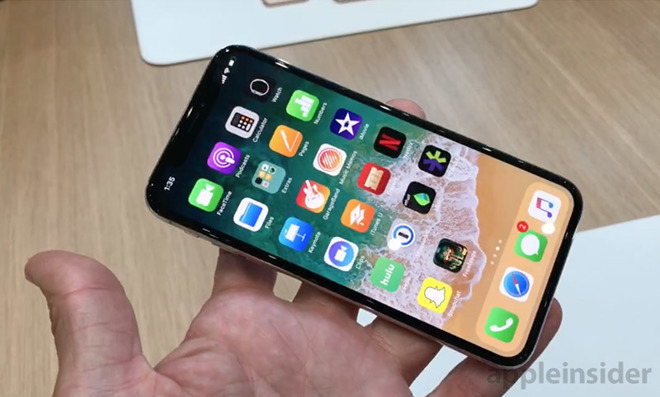 The black sensor array on iPhone X essentially blends away when watching video full screen. And when used as a phone, it helps differentiate between pulling down Control Center from the top right (the "ear" where the signal and battery meters sit) and pulling down your notifications from the center or left of the screen. This rejiggering of standard iOS gestures also helps get rid of the Home Button, because now you can simply swipe up to go to the Home screen or swipe and hold to switch between running apps (a simple and intuitive gesture that also brings it in-line with how iPads work in iOS 11). Forcing the entire installed base of iPhone users into this new way of working might cause some blowback, as the majority of people don't like change. 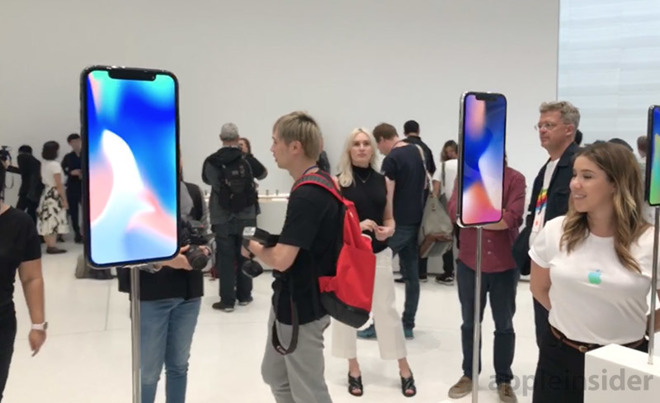 But tying these new mechanisms to a premium phone that you have to pay extra for means that iPhone X users will effectively be asking for the new behavior, rather than being pushed into it. 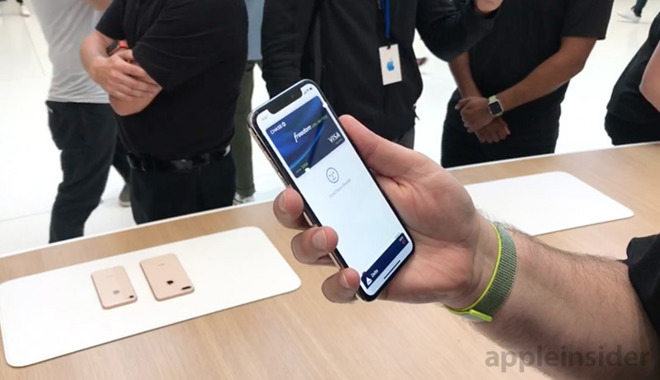 The other features tied to the Home button, Touch ID authentication and Apple Pay, are now triggered by the side button, bringing iPhone X payments in line with how it works on Apple Watch. This also enables Face ID as a rapid way to authenticate without a fingerprint sensor. This also helps explain why Apple never implemented some of the features that could have been attached to the Touch ID sensor (such as using it as a pointing device with finger gestures)—Apple knew it wanted to eventually get rid of Touch ID and reclaim the Home button real estate. In one leap, that Home button migration is now done—at least for buyers opting into Apple's Future Phone. For everyone else, Touch ID continues to work the way it has. It remains to be seen what percentage of iPhone users will opt into these new ways of working. On one hand, there are changes to get used to and significant additional upfront expense. On the other hand, these changes are insanely great, enable other super cool features (such as animate emoji or "anamoji," which are incredibly fun to use), and actually simplify how iOS works. Apple may have a hard time building enough. The iPhone 6, 6s and 7 generations each sold around 170 million units in their first year. There simply is no source on Earth capable of supplying 170 million good-quality OLED screens within a year, nor can any vendor afford to produce and sell that many 3D depth sensors (the add-on Occipital Structure Sensor for iPad and the rare Android device supporting Google's Project Tango all shipped in volumes far short of one million). However, by offering a premium-priced iPhone X, Apple can introduce a mainstream 3D True Depth sensor and Super Retina HD OLED display for its premium-hungry audience, and build both into an extremely high quality device that looks premium and feels ultra-luxurious. This was so obvious we could observe it before even looking at iPhone X up close, or having a completed list of its features. Perhaps less obvious is the fact that the premium $999-and-up price of iPhone X will not only fund the development, implementation and fabrication of features like the new True Depth sensor and Super Retina HD, but will also help pay for other new features that are shared with its more mainstream cousins, iPhone 8 and 8 Plus. 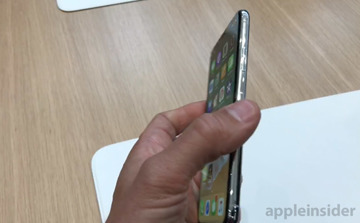 Some new "X" features shared across the board include its impressive build quality, including the glass back that enables Qi wireless charging and makes the latest base model iPhone 8 options look like iPhone 7's Jet Black on steroids (and in three different colors of gloss: silver, space grey and gold). All models also share Apple's super fast A11 Bionic chip, as once you design advanced silicon logic, the more chips you fab the less they cost. So sharing the part between both 8 and X product lines allows Apple to also enhance Portrait mode and its dynamic, non-destructive lighting features across all of its 2017 iPhone releases. iPhone X additionally enables Portrait mode selfies, using its True Depth technology. Everyone who has used Portrait mode on iPhone 7 Plus already knows how great it would be to have that same kind of technology improving their selfies and front-facing group shots as it already does for their photos of kids and pets (and any inanimate objects that need some heightened drama for Instagram). 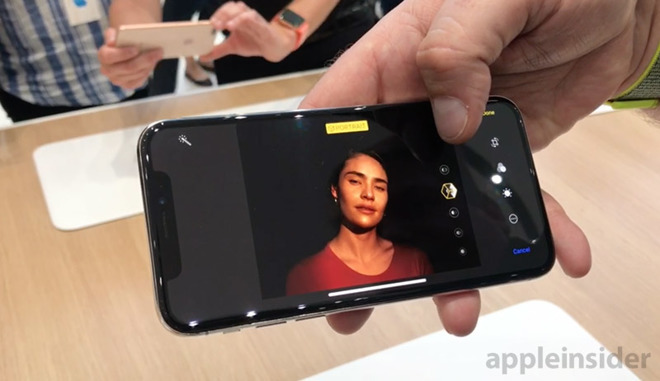 Apple's new A11 Bionic chip is a major leap in both processing power and efficiency, enabling that huge new expansion of Portrait mode photography—which became one of the most popular and impressive features of last year's iPhone 7 Plus. 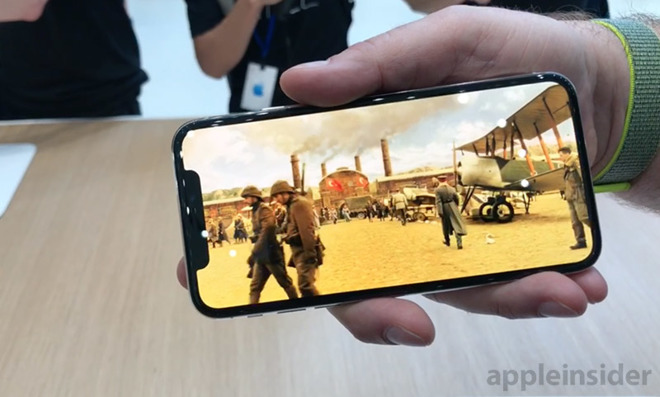 The new chip also drives the responsiveness of upcoming ARKit apps and games, in part because it includes Apple's propriety new GPU for accelerating graphics, a feat we weren't certain Apple could pull off so soon. The Apple GPU is one of the biggest announcements of the event, but it got the least applause simply because the public doesn't yet fully recognize how important this is right now and into the future. Apple was already leading in mobile devices—particularly in gaming and the smoothness of iOS' UI—simply because it had selected the best available third party GPU designs (in contrast to Android and Windows Phones that were content with more basic graphics). But now Apple has its own in-house GPU technology, and has the ability to tightly optimize its products to achieve even greater differentiating capabilities. Note that GPU cores aren't limited to accelerating graphics but are also increasingly being used to plough through tons of specialized math, such as in machine learning and artificial intelligence. The billions of dollars Apple is investing in GPU technology will further widen the gulf we've seen grow between $650 iPhones and average Android phones that now sell for less than $300 via more basic commodity components. But Apple's proprietary GPU technology will also trickle down to mobile devices such as Apple Watch, where the state of the art in $650-and-up smartphone technology has already started driving tomorrow's scaled down micro-devices and appliances like Apple TV 4K and the new HomePod. Qualcomm and other mobile chip vendors have lots of Android phone makers to sell their chips to, but those makers are not capable of selling high end devices in iPhone-like quantities. Further, they're also not selling significant numbers of ultra mobile devices such as smartwatches. That means that even if Qualcomm were to develop advanced high end GPUs and super efficient watch chips, it wouldn't have buyers to sell them in volume. And because volume is such a huge factor in overall pricing (to spread out the cost of initial development), there's a catch-22 in place that serves to maintain the status quo in Android-land of serving the low end and medium tiers where smartphones only need to be "good enough."